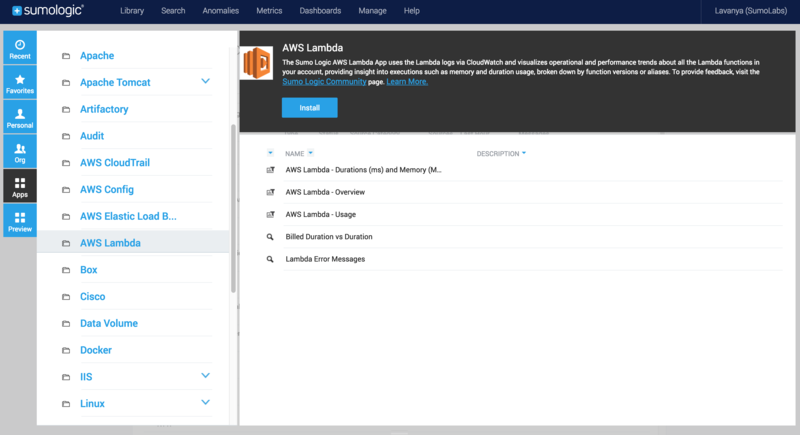 Today, Sumo Logic made its App for AWS Lambda generally available and introduced a purpose-built Lambda function, which is immediately available for launch in the AWS Blueprint library. Now, customers using Lambda functions can better visualize things like metering for code execution, predict compute usage, and monitor memory limits through Sumo Logic’s predictive analytics capabilities, thus helping to optimize performance and cost. Lambda handles the scaling of the service behind the scenes, while sending operational logs to CloudWatch. To gain a better handle on costs, customers have requested greater visibility and predictability around Lambda usage. Sumo Logic is purpose-built for this, allowing you to see statistics like compute usage and billed duration, and drill down into items like compute usage by function. The Sumo Logic App also calculates your unused memory. This is important because when you allocate memory and are billed based on memory size, unused memory can be an indicator that you aren’t allocating appropriately. Compute usage by function. Sumo Logic converts MB to GB and milliseconds to seconds to get the real billing numbers used, and reports over the last 12 hours. Predicted compute usage by function (GB-sec) based on the behavior of the last 12 hours. Billed duration of functions by the hour as a line chart juxtaposed with a trendline for the predicted billed duration on a timeline for the last 24 hours. Maximum memory used by functions as a line on an outlier chart with the threshold displayed as the area, on a timeline for the last 24 hours. The Sumo Logic App also allows users to drill down to analyze the number of requests, billed duration and memory utilization of an individual function, as well as function version. This allows users to assign a hard number to assess the impact of a code change across different versions of the same Lambda function, and easily make cost/benefit trade-offs. In other situations, where different departments own and manage their own set of Lambda functions, the Sumo Logic App for AWS Lambda allows the admin to identify the billing contribution of each function and charge that portion of the bill back to a specific department. AWS Lambda generates operation logs which are exposed via CloudWatch. Every time a function is triggered, it generates useful troubleshooting logs. When a new CloudWatch log becomes available, the Sumo Logic Lambda function for CloudWatch routes that log message to a Sumo Logic webhook. This in turn, acts as the data source for the dashboards and searches enclosed within the Sumo Logic App. Setting up the Lambda function is easy and can be done under 15 minutes. If you don’t already have a Sumo Logic account, you can try it free. Go to www.sumologic.com/signup-free. Step 1. Create a Lambda function that routes CloudWatch logs to Sumo Logic. Step 2. Install the Sumo Logic App for AWS Lambda from the library. Select a source category and choose Install. Choose Go when asked to confirm. Step 3. Customize the dashboard and add alerts. Modify the parameters of the search queries. Admins and other users can create custom alerts for themselves so they can be warned of potential spikes. Sumo Logic Lambda functions are open source and available on GitHub. There you’ll find source code for Lambda functions for Amazon Kinesis, Amazon S3 and Amazon CloudWatch Logs. The latter is what powers the Sumo Logic App. As CloudWatch logs become available, the Lambda function processes the data and passes it to Sumo Logic. 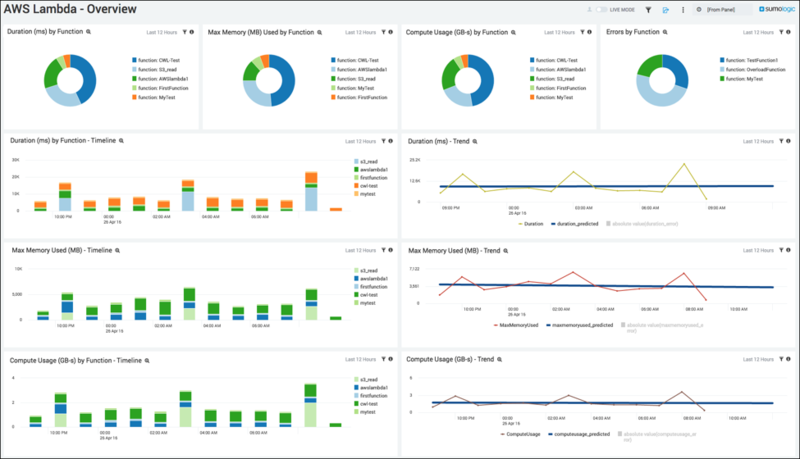 Assuming you have the Sumo Logic App installed, you can then use our pre-built dashboards and searches to get visualizations or troubleshoot and monitor your applications and systems hosted on AWS. We encourage Lambda developers to contribute to the repository. As AWS users increasingly find interesting and unique ways to leverage Lambda, their usage of the service and the number of functions they deploy in their accounts will rapidly grow. The simplicity and the power of Lambda makes it easy to create a function for every application and even maintain different versions of each function.